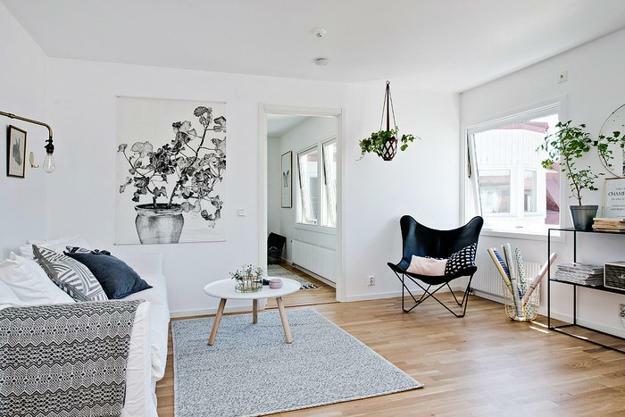 Black-n-white decorating ideas in Scandinavian style can turn small rooms into spacious living spaces and create beautiful and modern interior design with a touch of other accent color. Lushome presents white and black apartment ideas, spiced up with green house plants which create natural and pleasant environment. Decorating small apartments and homes calls for light neutral colors. 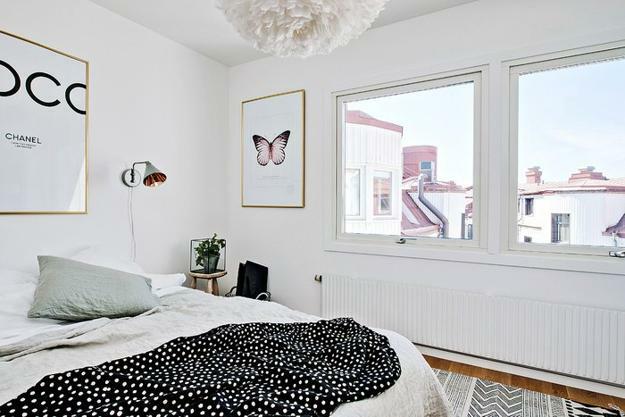 White paint colors and black and white decor are ideal for all who appreciate the Scandinavian style. 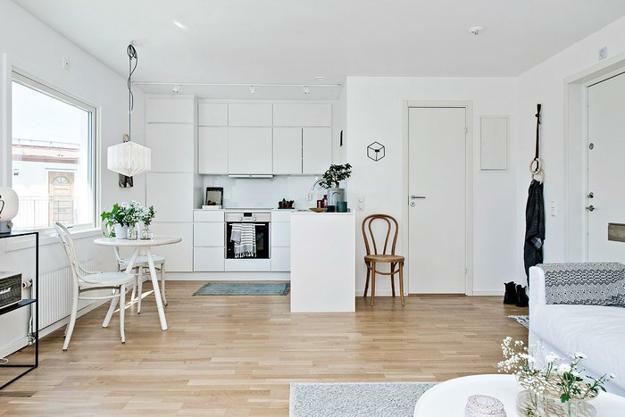 40 square meters in this apartment in Sweden look airy and bright. White decorating ideas visually increase the space size and turn small rooms into large living spaces. 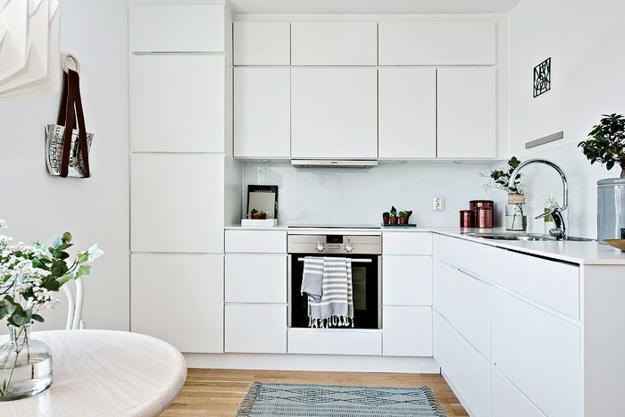 White paint colors, white room furniture and white kitchen cabinets are stylish and versatile choices for decorating small apartments and homes. Black and white decor ideas work well with any accent colors and feel in harmony with green house plants. House plants offer a great green color to use for accentuating black and white decor. White paint colors, white furniture and decor accessories never make small spaces feel too small. 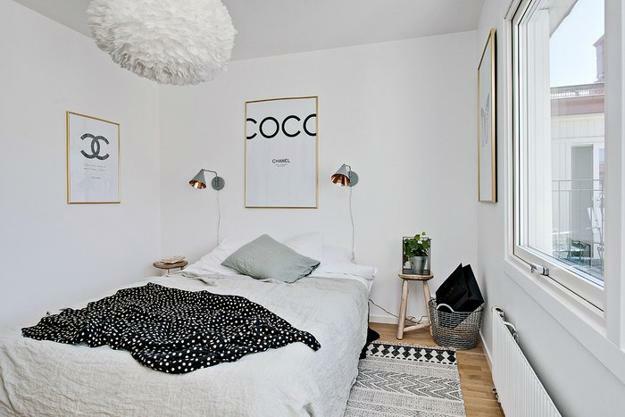 Scandinavian designers like to work with white decorating ideas and a touch of black. Comfortable room layout and white decorating add spaciousness, functionality and comfort to small rooms. Large windows that provide nice views and invite lots of natural light inside are wonderful for decorating small apartments and homes. 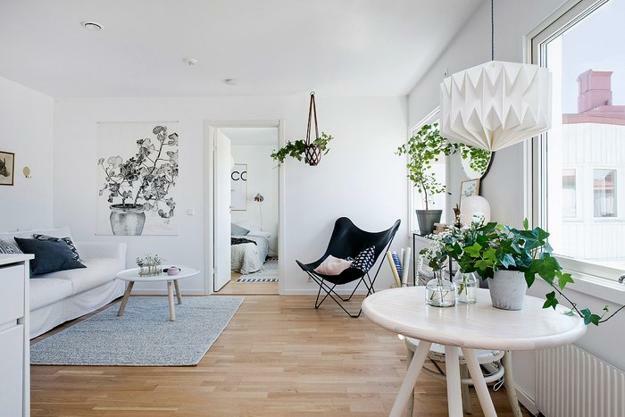 Traditionally Nordic designs ad interior decorating in Scandinavian style are practical, functional and elegantly simple. 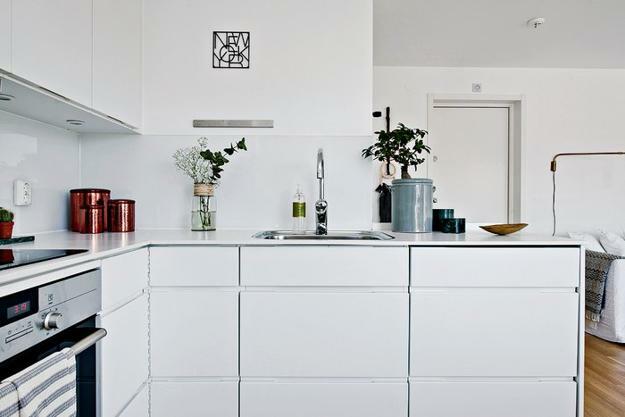 White paint colors are one of the main tools that define the Scandinavian style. White paint colors create a wonderful effect, a pleasant illusion of bigger spaces. 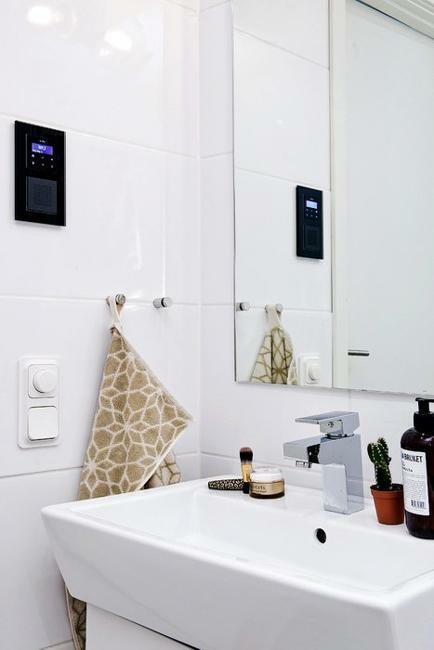 White decorating ideas allow to change room sizes and adjust its proportions, creating beautiful and balanced small rooms. Variety interior design and decorating materials, wall art and home decoration, modern patterns and green plants help add interesting look to white decorating. 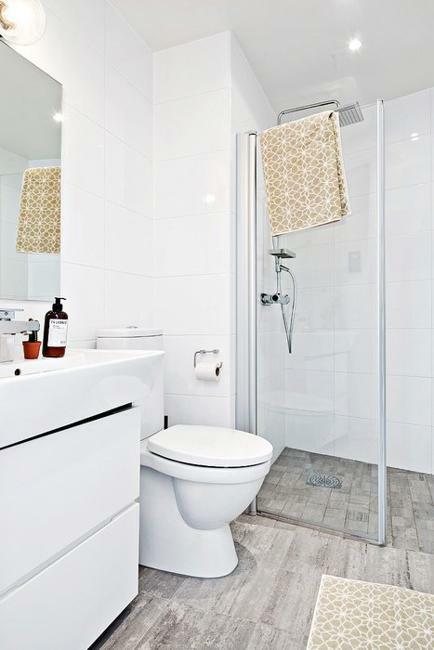 The bathroom floor is decorated with ceramic tiles imitating light wood planks. White kitchen cabinets are combined with walls in pale gray color. Kitchen backsplash design is made of glass that adds reflections, brings more natural light inside and visually stretches small spaces. 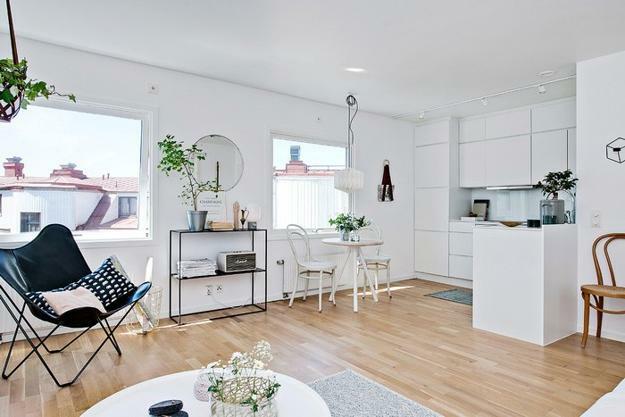 Natural wood color tones are a popular technique in decorating small apartments and homes in Scandinavian style. Light wood color gives warmth to modern interior design while softening white decorating ideas.